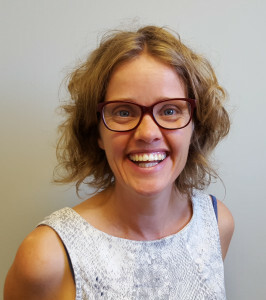 Jantina de Vries, University of Cape Town, was one of the first researchers to publish on AAS Open Research. 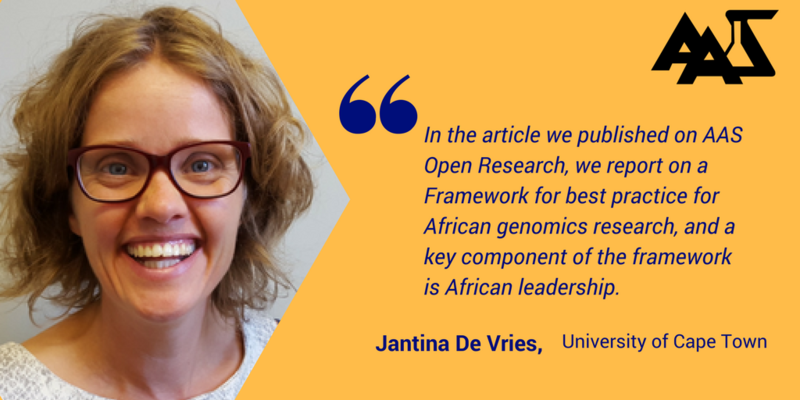 Here, Jantina discusses her Open Letter, currently awaiting peer review, which describes a framework for genomics research in Africa, explaining how the ethics of such research and biobanking can be improved. The launch of the AAS Open Research platform provided us with a very exciting opportunity to rapidly publish our article in a way that everyone can access. In our article, we describe the content of the Framework for Best Practice for African Genomics Research and Biobanking that we developed through the H3Africa Working Group on Ethics. We wanted the article to be as widely available as possible to anybody working on the African continent, without journal subscriptions or paywalls.  AAS Open Research is an exciting new way to publish scientific data and a range of article types, and we are curious to see how it will change the way in which results are published. We were glad to be part of this innovation from the start. Offering a sustainable way to ensure rapid, no-cost open access publication is particularly important on the African continent, where even in the context of open-access publishing there remain many impediments for African researchers to publish their work. Many times, the publication fees are extortionate – for instance, I was recently given the option to pay close to US$4000 to make an article available open access. The alternative is to publish in journals that do not charge publication fees, but the implication is that the articles may not be available widely, including to African researchers. The AAS Open Research platform fills this gap and ensures that all African scholars can publish and read work relevant to their context. In H3Africa, we ran a number of Ethics Consultation Meetings where we invited members of national and regional ethics committees from around the continent, to discuss what they viewed as the ethical challenges in genomics research. We quickly realised that many ethics committees are operating in a vacuum, without proper guidance about what issues they should consider and what they should look out for. At the same time, we still see regular examples of research collaborations that are not equitable. We agreed that guidelines were required to help with the review and conduct of genomics research. The Framework offers the minimum standards for this research, and we spent a considerable amount of time getting different stakeholders to agree on what those standards should be. We were quite inclusive in our approach and involved researchers, members of ethics committees and national ethics councils, and representatives of funding organisations in the process of developing the guidelines. Our next step is to use the Framework to develop more detailed ethics guidelines that ethics committees can adopt wholesale or adapt to their own context. Following publication of our article, and the two associated pieces in Nature, including a News article and Editorial, which describe the Framework, we have been contacted by several ethics committee members from across the continent who are keen to help us in this process. We hope that organisations like the African Academy for Sciences would equally be interested in the ongoing development of ethical standards for genomics research on the continent. Lastly, several members of the H3Africa Working Group on Ethics have been asked to provide training courses for ethics committees from various countries on the continent, so that is another way to ensure wide uptake of the Framework principles.